How to: Use these grow lights to form faster flowers with bigger buds, and grow larger fruit? Use these low wattage grow lamp just 5 - 15 minutes a day Indoors or lights out. In the Greenhouse and/or Outdoors 30 minutes to 1 hour before and after sunset. It's like having a "26 hour day". Indoors finish 7 - 14 days sooner when using a 12/12 regime. 3 to 4 weeks earlier outdoors. 20 Watts Covers an 8' X 8' area at 4' above the canopy, up to 16' X 16' at 7.5' above the canopy. With 12/12 Short Day plants the length of the night controls flowering. the Flower Initiator effectively "adds" 2 hours to the night by switching the phytochrome state rapidly, rather than taking two hours. Flowering at 13 hours on and 11 hours off, is like 13 on and 13 off, for more urgent flower growth and more total light daily, for bigger yields and higher quality, the best of both worlds. HPS and induction grow light growers report starting at 12/12 then running at 13.5/10.5 and finishing at 11/13 produce improvements in all factors, quality, yields, etc. Some growers flower at 12/12 for quite urgent growth, it's like having a 12 hour day and a 14 hour night. You can flower at 13/1113.5/10.5, or 14/10 after buds began to form. One can return to 12/12 when one goes to flush, generally the final three weeks to have a very mature finish. 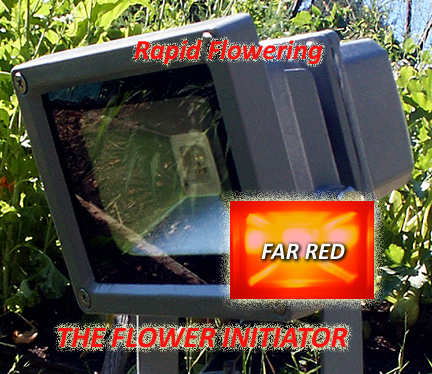 Outdoor and in the Greenhouse: Run the Flower some before and after sunset, 15 min. to 30 min will suffice, this also reduces the number of times one will need to re-calibrate to sunset. One can start flowers when the night is 10 hours long with a 12/12 short day plant. Flowering under such long days means instead of growing huge plants you get huge bud clusters. Advanced experimenters run DEEP BLUE after the Flower-Initiator for a few minutes to one hour will prevent any stretching, If it is of concern,without negative effects on flowering. Some growers report some benefit to running blue all night during bloom, I advise no more than 4 hours. up to 16' X 16' at 7.5' above the canopy. Use a Sunset and Sunrise service to determine the length of your night. Growers say it's a positive "Freak of nature", with "More of everything"! Outdoors and in the Greenhouse: In the fall you when the night becomes 10 hours in length you can reduce or eliminate the need for greenhouse curtains, or use it in tandem to manipulate flowering further, or start even sooner. In the southern tear many strains can be flowered in the spring without curtains.